...and wishing I could find it! This is my estimate as to when we are due...Mar. 16, 2011. I have a "stick it to me" day on Aug 6 (I guess this is where they just do all the blood work, urine tests, all the fun stuff...then they schedule me to see the dr.). Hopefully they will tell me when I am due exactly on Friday! We are super excited! It's been over 6 yrs since we had Niko. I think that the age difference will be just fine! So many people tell me that I should have them close together so they can play together, but honestly, I couldn't have handled another one so close! It wasn't until Niko turned 4 that I was even willing to CONSIDER another kid! haha...And, I also, don't remember my sister and I being so "close" even though we were only 1 yr apart! I think Niko will be a HUGE help and will be excited to have a little baby in the house. He keeps asking when we get to bring the baby home! Well, that's all for now...just wanted to log in and update my blog (it's been forever, I know)! I will definately be making tons of stuff for the baby and posting all of it on here, so stay tuned! O.K...here it is...the moment some of you cheap-ies (haha..just kidding...relax) have been waiting for! Last year's clearance sale on purses. If you are local, you pick up and pay cash... if you aren't local, average shipping is $4.95 but ask before you pay w/ paypal. So, there you have it! Awesomely reduced prices on high quality purses! Get 'em while they last...first come first serve! I accept paypal (paypal account: simplysandra@vsgonzalezgroup.com) if you aren't local and cash if you are. Please do not forget to include the $4.95 shipping if you are paying through paypal. If you have questions about a particular purse please email w/ name of bag in title BEFORE buying. I'm not responsible for any expectations you may have if you have not bothered to email and ask. For YOUR protection, always feel free to ask about a particular item and for more pictures before you buy, so YOU know what you are getting. Thanks for understanding. No returns accepted on these purses. I'm trying to clear out my stock to make room for this season, hence the incredible prices! Well, the season is upon us...only 3 months until the Kentucky Derby Marathon...and this year, I'll be running it! I am so excited! This will be my first marathon and I am looking for some sponsors, either business or individual. The money will help to offset the costs of the training races, race fees, lodging, food and other misc expenses that I will incur. All donations are welcome and can be made through paypal at: simplysandra@vsgonzalezgroup.com. Any donation of $100 or more will get you a "spot" for your name/organization/business on my running shirt! Any money left over from the donations at the end of the marathon will be donated to Kosair Childrens' Foundation. You can view my fundraising page at: http://www.active.com/donate/HelpKosairChildren/sandragonzalez. Feel free to make a direct donation to the cause by on the webpage. Thanks again for all your support. For more information please email me at: sandra@vsgonzalezgroup.com! First, are my grandparents' quilts. They celebrated their 60th wedding anniversary this Sept '09 and so I made quilts for each of them w/ everyone's signatures from the party included in the borders. This one is my Grandpa's quilt. I used a lot of homespun fabrics since my grandpa always wears flannel shirts. It matched him! The back of his quilt. This one is my grandma's quilt. I used all my floral fabrics in this one. I think it is so pretty. Her favorite color is green so I used a green background. I think any color would have matched! This is a purse I made for my cousin. My aunt ordered it for her Christmas gift. I really like this pattern. There are two pockets on the outside that are too cute! I also love the brown fabric! Inside are 2 pockets, one in the exterior fabric and one w/ the interior fabric. Here is my sister w/ her sewing tote. Sorry the picture is bad...I don't know how to use this crazy digital camera! Her bag is like a large rectangular tote w/ 3 pockets on each side, one long pocket (for patterns, newpaper, magazines) on one side behind the 3 pockets, and one pocket on each end. It was fun to make and totally handy to carry everything in! I think I am going to make myself one to carry my sewing machine in! *sigh* Again, sorry about the crazy pictures:( Some day I will learn about this camera...some times it works and other times it doesn't???? This is my mom's tote. The fabric is a vintage fabric w/ old McCall's patterns printed on it. My mom saw it at the store and really liked it. This is my bro-in-law's computer tote. He likes Harley Davidson (hence the flames!)! This is my honey! Isn't he a cutie!?! Since moving to Indiana from So. CA, he has FROZEN! So, along w/ tons of thermal underwear he got from everyone else, I made him this Mexican Quilt! (Yes, for those quilters, you'll notice the edges aren't bound yet...they are now, I just haven't taken an updated picture!). It is made from flannel and velvet, so it is HEAVY and very warm! He loves it!! Dec. 5th, 2009. My cousin, the one in red, (she's also the one who got the purse), and my son and I ran a Santa Chase race. My son ran the 1 mile fun run, started about a 1/4th mile behind everyone else (we were late...so bad, I know!) and still ended up coming in 6th place! Way to go Chango! Amy and myself ran the 5k! It was FREEZING!!!! I did have a goal of beating my previous 5k PR of 38 min and did 36:36!! YAY! Now, on to the marathon in April! Just mama and Niko being silly! This is what it should have been! We are cutting pork for tamales for Christmas! My son opening his "big" gift...the paper was some shipping paper that my son had sponged bells, stars, snowmen and Christmas trees on...homemade wrapping paper and craft time all in one! It was an EASEL!!! Fun!!! And once all the work and festivities were done....I made myself a new purse in honor of mis perros locos! The fabric has "hunting" dogs (mostly spaniels and labs). My two dogs are in there somewhere! I thought it needed a bow to give it a more "feminine" look since it was a lot of brown. 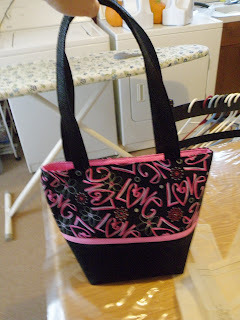 I added a zippered pocket on the inside on one side and 3 pockets on the other side. There were also a handful of orders that were filled, millions (or what seemed like it) of tamales for Christmas, some shopping, and lots of running all mixed in this past few months. So, while I haven't updated the blog much, know that I haven't been doing nada! Having a baby? Need a gift for someone who is??? I now have diaper bags for sale. Here are two I finished the other day. Way too cute! I love the colors. Of course each bag can be made to order in any popular character or color scheme. Only $45 each! Isn't this gorgeous?! It is quilted to add texture. I love the blue/brown combination of colors! So nice! Names can be embrodered (is that spelled right? haha) on the front for an additional $5. Held closed with a tie. So simple and so cute! I love these colors! The blue is very vibrant. Inside are two large pockets that could fit anything from diapers to wipes to baby powder or a change of clothes. This is the outside pocket...extra large to fit bottles of any size. There are two outside pockets...one on each side of bag. Here is the pink version! Just as cute!!! And the awesome interior with the same 2 large pockets! These are great bags, very durable and classy. Dads don't have to worry about the bags being too "cute-sy" and mom's can carry a bag that is as stylish as it is functional! So...as promised, I did finally go buy some batteries for my camera! I know, I know, major slacker! But the good news is...I haven't just been sitting around doing nada...here are some new projects I have been working on! Isn't this just gorgeous? Made of brocade and faux leather, it has an absolutely classy look! I added a black silk bow for the finishing touch. The inside has 3 pockets and a magnetic snap. Only $25!!! What a deal! When I'm not working on purses, I love to quilt! I have been working on this quilt for a while now and mind you, this is only the pieced top...it isn't quilted yet. I do love it though!!! How cool is this?! I call it the "God's Eye" quilt because it reminds me of those crafts we used to make as kids with the varigated yarn and popcicle sticks in Spanish class! I just love the colors!!! Up close you can see that it is made up of dozens (seemed like zillions) of small squares! A bit time-consuming but the end result was sooo worth it! My son has to model everytime I take a picture! This is a large throw size or a twin/full size "topper" (fits just across the top of a full size bed w/ no overhang). Buy it now for the holidays...makes an amazing gift! Will be machine quilted with black back and multi-colored thread. Only $200!!! So, there ya go...now you know what I've been up to while the batteries were dead!